NIU’s Office of Student Engagement and Experiential Learning (OSEEL) is now accepting applications for two service-learning programs specifically designed for first-generation college students or Pell grant recipients. 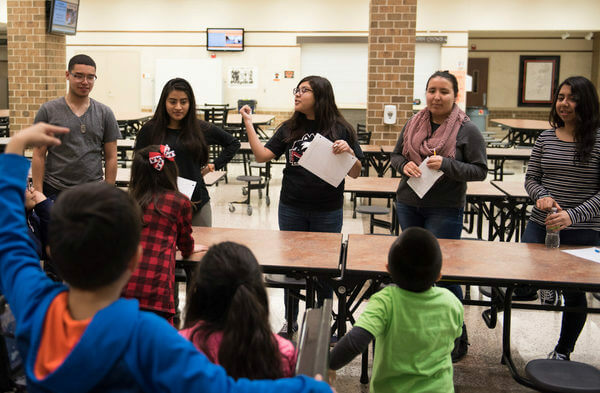 NIU Service Leaders Program matches sophomore, junior, or senior first-generation college students eligible for Federal Work-Study with a local school or organization that engages with local youth in civic engagement activities and programs for one academic year. NIU Service Leaders working in teams also attend monthly cohort meetings geared toward professional development and academic resources, and commit to approximately 5-10 hours per week to the program. Eligible students can learn more about the program and application process on our website or by visiting our office. Huskie Service Scholars is a program for eligible incoming freshmen or transfer students who enjoy engaging in the community. Students connect through a supportive peer network and engage in weekly service activities on-campus and in the community. They work in teams at different campus partner sites and meet monthly during cohort meetings and engage in peer mentoring geared toward professional development, reflections and academic resources. Students receive a $1,200 tuition waiver for active participation and completion of the program. To learn more about the program and application process please visit our website. Both applications are due by Monday, July 31. For questions, please contact Nelisha Gray at service@niu.edu or 815-753-8156.